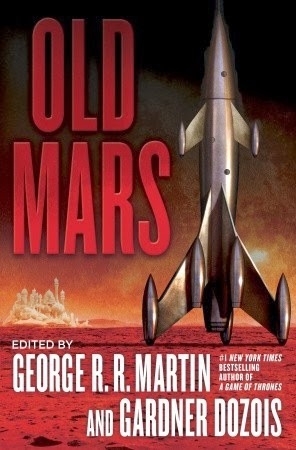 Thanks to the generosity of the folks at Bantam Dell, I have three copies of Old Mars, a new science fiction anthology edited by George R. R. Martin and Gardner Dozois, up for grabs! For more info about this title: Canada, USA, Europe. Fifteen all-new stories by science fiction’s top talents, collected by bestselling author George R. R. Martin and multiple-award winning editor Gardner Dozois. The rules are the same as usual. You need to send an email at reviews@(no-spam)gryphonwood.net with the header "MARS." Remember to remove the "no spam" thingy. Even better, here's a teaser extract from the anthology! The most dangerous man on Mars was Omar al-Baz, and the first time I saw him, he was throwing up at the Rio Zephyria spaceport. This happens more frequently than you might think. People coming here for the first time often don’t realize just how thin the air really is. The cold surprises them, too, but I’m told the atmospheric pressure is about same as you’d find in the Himalayas. So they come trooping down the ramp of the shuttle that transported them from Deimos Station, and if the ride down didn’t make them puke, then the shortness of breath, headaches, and nausea that comes with altitude sickness will. I didn’t know for sure that the middle-aged gent who’d doubled over and vomited was Dr. al-Baz, but I suspected that he was; I hadn’t seen any other Middle Eastern men on his flight. There was nothing I could do for him, though, so I waited patiently on the other side of the chain-link security fence while one of the flight attendants came down the ramp to help him. Dr. al-Baz waved her away; he didn’t need any assistance, thank you. He straightened up, pulled a handkerchief from his overcoat pocket, and wiped his mouth, then picked up the handle of the rolling bag he’d dropped when his stomach revolted. Nice to know that he wasn’t entirely helpless. He was one of the last passengers to step through the gate. He paused on the other side of the fence, looked around, and spotted the cardboard sign I was holding. A brief smile of relief, then he walked over to me. “Yes, I’m your guide. Call me Jim.” Not wanting to shake a hand that just wiped a mouth which had just spilled yuck all over nice clean concrete, I reached forward to relieve him of his bag. “Sure. No problem.” He hadn’t hired me to be his porter, and if he’d been the jerk variety of tourist some of my former clients had been, I would’ve made him carry his own stuff. But I was already beginning to like the guy: early 50’s, skinny but with the beginnings of a pot belly, coarse black hair going grey at the temples. He wore round spectacles and had a bushy mustache beneath a hooked aquiline nose, and looked a little like an Arab Groucho Marx. Omar al-Baz couldn’t have been anything but what he was, an Egyptian-American professor from the University of Arizona. I had only the vaguest idea of why he’d hired me to his guide, but the noise and bustle of the terminal was too much for a conversation. Passenger bags were beginning to come down the conveyer belt, but Dr. al-Baz didn’t join the crowd waiting to pick up suitcases and duffel bags. Instead, he went straight to the PanMars cargo window, where he presented a handful of receipts to the clerk. I began to regret my offer to help carry his bags when a cart was pushed through a side door. Stacked upon it were a half-dozen aluminum cases; even in Martian gravity, none small enough to be carried two at a time. “You gotta be kidding,” I murmured. I looked over the stack of cases and decided that there weren’t so many that I couldn’t fit them all in the back of my jeep. So we pushed the cart out to where I’d parked beside the front entrance, and managed to get everything tied down with elastic cords I carried with me. Dr. al-Baz climbed into the passenger seat and put his suitcase on the floor between his feet. “Hotel first?” I asked as I took my place behind the wheel. When I was a kid, one of my favorite movies was The War of the Worlds – the 1953 version, made about twelve years before the first probes went to Mars. Even back then, people knew that Mars had an Earthlike environment; spectroscopes had revealed the presence of an oxygen-nitrogen atmosphere, and strong telescopes made visible the seas and canals. But no one knew for sure whether the planet was inhabited until Ares I landed there in 1977, so George Pal had a lot of latitude when he and his film crew tried to imagine what a Martian would look like. Anyway, there’s a scene in the movie where Gene Barry and Ann Robinson have made their way to L.A. after escaping the collapsed farmhouse where they’d been pinned down by the alien invaders. Barry meets with his fellow scientists at the Pacific Tech and presents them with a ruined camera-eye he managed to grab while fighting off the attackers. The camera-eye is wrapped in Ann Robinson’s scarf, which was splattered with gore when Gene clobbered a little green monster with a broken pipe. I’ve always loved that part. So when Dr. al-Baz said much the same thing, I wondered if he was being clever, copping a line from a classic movie that he figured most colonists might have seen. But there was no wink, no ironic smile. So far as I could tell, he was as serious as he could be. I decided to let it wait until we had that drink together, so I held my tongue as I drove him into Rio Zephyria. The professor’s reservation was at the John Carter Casino Resort, located on the strip near the Mare Cimmerium beach. No surprise there: it’s the most famous hotel in Rio, so most tourists try to book rooms there. Edgar Rice Burroughs was having a literary renaissance around the time it was built, so someone decided that A Princess of Mars and its sequels would be a great theme for a casino. Since then it’s become the place most people think of when they daydream about taking a vacation trip to Mars. Good for them, but I want to throw a rock through its gold-tinted windows every time I drive by. It’s a 10-story monument to every stupid thing humans have done since coming here. And if I feel that way, as someone who was born and raised on Mars, then you can well imagine what the shatan think of it … when they come close enough to see it, that is. It was hard to gauge Dr. al-Baz’s reaction when we pulled up in front of the hotel lobby. I was beginning to learn that his normal expression was stoical. But as a bellhop was unloading his stuff and putting it on a cart, the professor spotted the casino entrance. The doorman was dark-skinned and a little more than two meters in height; he wore the burnoose robes of an aborigine, with a saber in the scabbard on his belt. The professor nodded and was quiet for a little while. The University of Arizona might not have sprung for a grad student’s marsliner ticket, but they made up for it by reserving a two-room suite. After the bellhop unloaded his cart and left, Dr. al-Baz explained that he’d need the main room—a large parlor complete with a bar—for the temporary lab he intended to set up. He didn’t unpack right away, though; he was ready for that drink I’d promised him. So we left everything in the room and caught the elevator back downstairs. The hotel bar is located in the casino, but I didn’t want to drink in a place where the bartender is decked out like a Barsoomian warlord and the waitresses are dolled up as princesses of Helium. The John Carter is the only place on Mars where anyone looks like that; no one in their right mind would wear so few clothes outside, not even in the middle of summer. So we returned to the jeep and I got away from the strip, heading into the old part of town that the tourists seldom visit. There’s a good watering hole about three blocks from my apartment. It was still late afternoon, so the place wasn’t crowded yet. The bar was quiet and dark, perfect for conversation. The owner knew me; he brought over a pitcher of ale as soon as the professor and I sat down at a table in the back.